Underwater Welding is a COOL job! 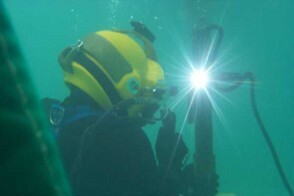 Underwater Welding is a unique way to make a living. These are very special people. They have diving skills plus welding & mechanical abilities. I salute them. One SURE way to get the training AND experience is in the Navy. Throughout this page I've included several photos via the Navy. 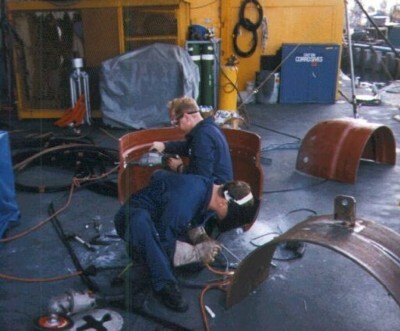 All credits go out to the Navy Welders and Photographers. 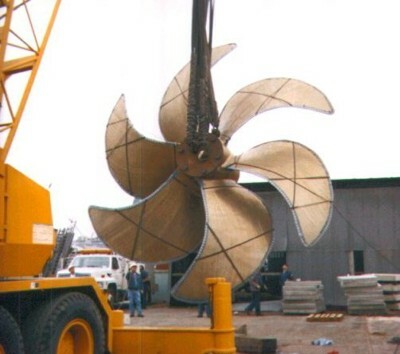 Timber companies that have their own cargo ships and that also pull logs up from the water via "log hauls", have occasional underwater welding needs. But the NAVY....well that's a full-time job. Click HERE to buy! THANKS! 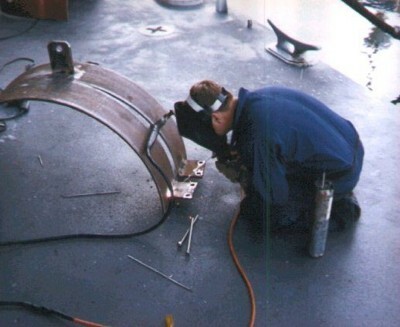 Wet welding simply means that the job is performed directly in the water. It involves using a special welding rod, and is similar to the process used in ordinary in-the-air welding. This is the cheapest method & the fastest to get the job done. All needed power & air supply units are above ground, via cables & air lines. But because of the effects of the water itself on the arc & the puddle process, it tends to be of somewhat less quality then dry welding. Dry welding: (Hyperbaric Welding) is done within a pre-built chamber to provide the dry air conditions. The welds are high quality, but the preparation costs & times involved can make it a less desirable way to go in many cases. Both methods have risks. But with careful preparation, safe equipment, & a top notch welder, you're "good to go". Below is a link to several welding schools all over the USA plus Canada! 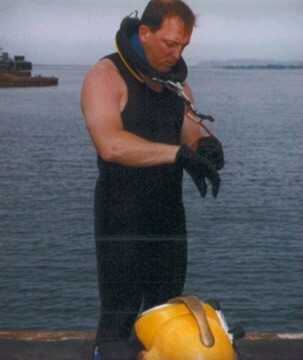 CLICK HERE for a great link to underwater welding schools! 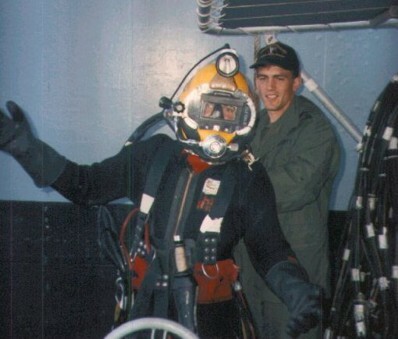 Below is a link to a 200 page PDF version of a Navy Underwater Welding and Cutting! Like any other arc welding jobs, there can be much preparation going on. They weld up all the parts they can before going "under". This is one of the bigger projects they'll eventually get involved with. Now finishing THIS job would really give you a feeling of accomplishment! Let's get "suited up" and get going! Gearing up for this kind of welding can be extensive. But you don't want to leave out any steps HERE. 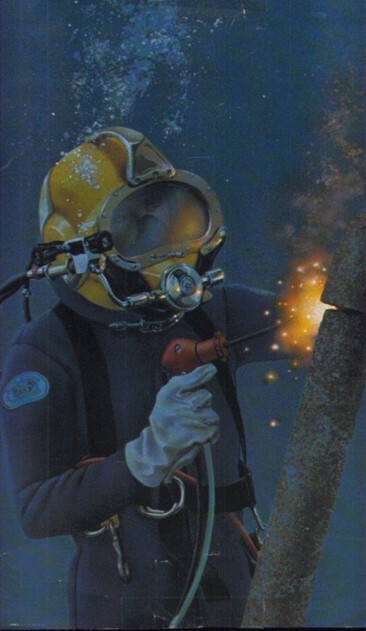 Both diving & underwater welding have been around for quite awhile. And there's more than just the Navy doing this stuff. Think about civilian ship-yards, off-shore oil-rig structures & more. Do some heavy on-line research if you wish to pursue this great special welding opportunity. Below is some grinding preparation. 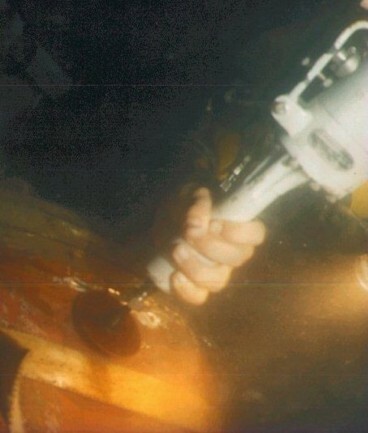 Then below that is actual underwater welding. Here's the U.S.Navy in action. By the way, although I spent time in the Navy, I'm NOT a recruiter!! I just admire how special this welding job really is. And I wanted to include this option in my website. Plus joining the U.S. Navy is one SURE way to get both some special training AND experience in the job. Didn't I already mention that? Well...it is a positive way to get you in the field! First is the gear bus with a self contained dive station. Second is inside the gear bus. 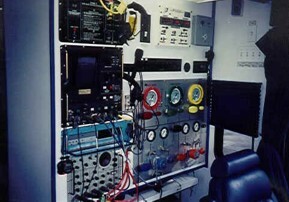 Third is the communication console. COOL huh? 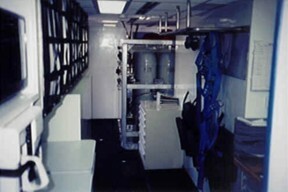 You can see in the above photos details of related Navy Underwater Welding Equipment. All this info plus these pictures give me a strong impression that the Navy really "has their act together" on this. Want MORE INFO on all welding subjects? Get it from my ebook, "The Arc And Beyond"!